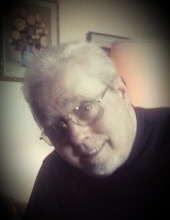 Larry E. Moore age 72 of Miami, Oklahoma passed away Monday, April 8, 2019 at Integris Baptist Hospital in Miami. He was born on October 22, 1946 in Miami, Oklahoma the son of Leslie & Alveta (Kelsey) Moore. Larry graduated from Miami High School in the class of 1965. He loved God and Coca-Cola and playing music with his brother. Larry and his brother James enjoyed their music together for many years. At the age of 15 he won 1st Place Soloist in the National Quartet Competition in Memphis, Tennessee. Larry sang and played guitar alongside his brother, James at the Faith Tabernacle Church in Commerce, for many years. In his early 20’s he was asked by the famous Rusty Goodman to make 2 recordings of which one accompanied by the Oak Ridge Boys. In his later 20’s he served his country honorably in the U.S. Army National Guard. He is preceded in death by his parents, and a brother-in-law, Jim Bill Minson. He is survived by his brother James Leslie Moore, of the home; one sister Shirley Ann Minson of Commerce, Oklahoma, 2 nieces, Diahann Brumley and her husband Chris of Miami and Maria Grindstaff and her husband Brian, of Springfield, Missouri. Also surviving are 2 great-nieces, Makenna Logan and Samantha White, both of Miami, Oklahoma, 1 great-nephew, Nathaniel Grindstaff of Columbia, Missouri and other relatives and friends. Funeral services will be held 2:00 p.m. Friday, April 12, 2019 at the Paul Thomas Funeral Home, in Commerce, Oklahoma with Rev. Danny Showen, officiating. Pallbearers will be Chris Brumley, Brian Grindstaff, John Depoe, Captain Ross, Bill Hames and Jamie Ohler. Honorary pallbearers will be Glen Wiford, Gregg Britton and Bob Cover. Interment will be held in the G.A.R. Cemetery, Miami, Oklahoma. To send flowers or a remembrance gift to the family of Larry E. Moore, please visit our Tribute Store. "Email Address" would like to share the life celebration of Larry E. Moore. Click on the "link" to go to share a favorite memory or leave a condolence message for the family.